Saturday, February 11 will go down in history as the first match ever for the newest MLS club Atlanta United FC. Chattanooga FC hosted a friendly between the two teams, and the crowds for both clubs were plentiful. There were kits, flags, and tifos everywhere you turned. The first goal ever scored by Atlanta United came from Argentinian Hector ‘Tito’ Villalba. The first goal in the club’s history came on a breakaway for United after a CFC turnover. Forward Kenwyne Jones had an opportunity on goal early in the 22’ minute but the goalkeeper managed to get a step ahead and hold the ball. 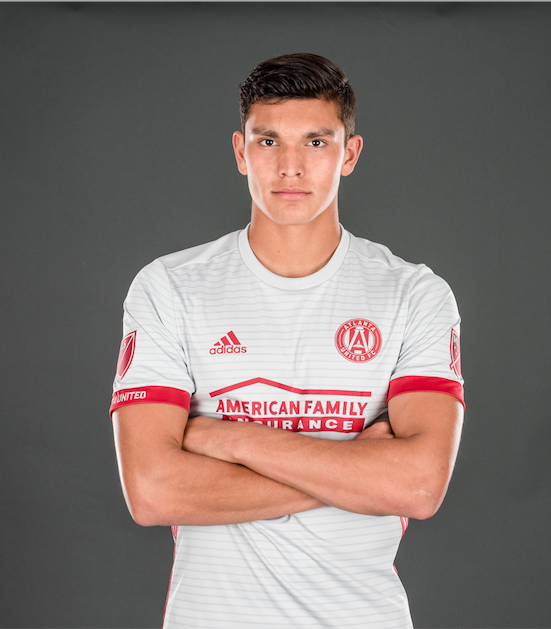 Atlanta United formed a wall of defense comprised of Yamil Asad, Chris McCann, Kenwyne Jones, and Carlos Carmona on a free kick (Hakim Wright). After their first goal, it was clear that the momentum had shifted to United’s side. Their possession was tight and their midfield, particularly Almirón did an excellent job distributing the ball. Jones had his second opportunity in the 29’ but the keeper got the best of him once again when Jones tried to finesse his shot wide and was blocked. In the 32’, Jeff Larentowicz and Miguel Almirón made way for Josef Martinez and Carlos Carmona. In the 35’ Yamil Asad launched a rocket from the corner of box and curled it in the top netting. If there was any doubt about the skill involved with the initial goal (which deflected off the keeper and rolled into the netting), there was no question about the finesse on that long-distance curler launched by Asad. In the 44’ a questionable no-call came with Jones went up for a header in the penalty box and received an elbow to the back that dropped him to the pitch. If this was a league game I’m pretty positive that would’ve been a penalty. At the start of the second half, Atlanta United surprised the crowd by coming out in their new secondary kits. To kickoff the second half, Atlanta United came on to the pitch debuting their brand new secondary kits. The predominantly white kit with red accents was received well by the masses and was followed up with a giveaway and a social media announcement. Anton Walkes sent a cross from the bottom corner that landed perfectly for Josef Martinez, who was able to head it in for goal number three. Martinez saw a second chance in the 72’ on a breakaway but the keeper parried the ball away. Chattanooga FC couldn’t clear the ball and Atlanta United’s Andrew Carleton charged forward and scored his first goal for the club. Resurgence was out in full force today in Chattanooga. 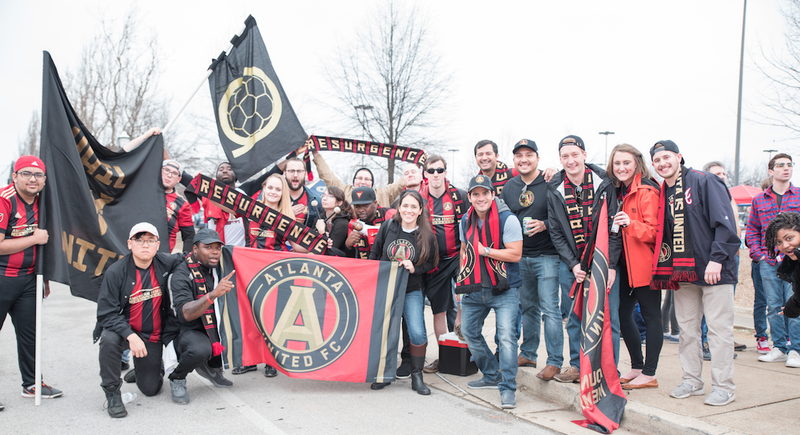 Resurgence is the official Supporters’ Club for Atlanta United FC (Hakim Wright). Although the first half was slow on offense, Atlanta United dominated the second half with possession and goals. Jacob Peterson picked up where Miguel Almirón left off, leading the charge in the midfield and setting up chances in the box. 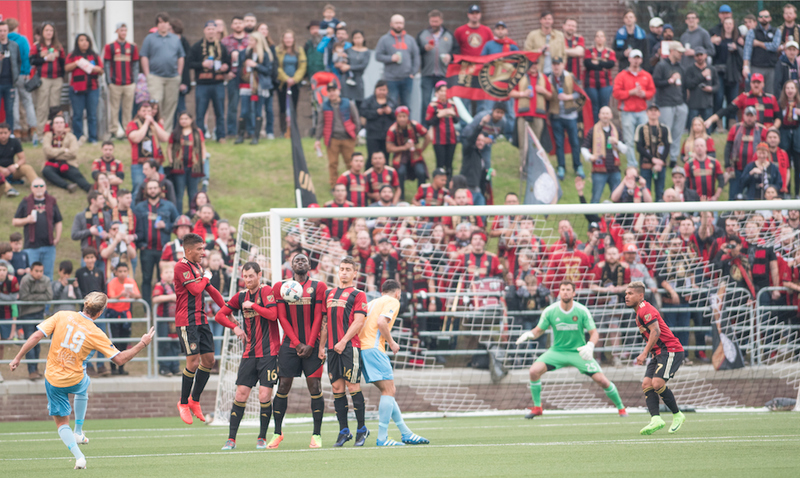 Our new MLS club pulled off the 4-0 victory in front of an intense 12,484 fans. As a treat to the fans, the players were available after the match for pictures and autographs. The club will return to training and prepare for their next challenge, the Carolina Cup.